Pat honed his inherent flair for hair at London’s world renowned Vidal Sassoon School of Hairdressing. His natural born ability was evident from the outset and during his training at Sassoon he received the highly contested honour of Stylist of the Year. He was already making a splash! On finishing his training and graduating from Sassoon Pat was chosen from a large number of competitors from across Ireland and the UK who were vying for the position as the Head of the Hair Team in Brown Thomas, Ireland. At the helm of this prestigious team for 2 years, his expertise, style and trend-setting creations attracted much attention and admiration, and firmly established Pat O’Neill as one of the leading names in Irish hairdressing. Pat and his team of Hair Stylists are setting the trend for Bridal Hair. Always on the forefront of Fashion and Wedding Hair. As the bride-to-be, you and your bridal party can relax and unwind in the beautiful surrounds of this exquisite suite, enjoy a glass of chilled champagne and dream… for this is the place where dreams and reality merge. The Style Suite has been created to help you bring your dream day to life. 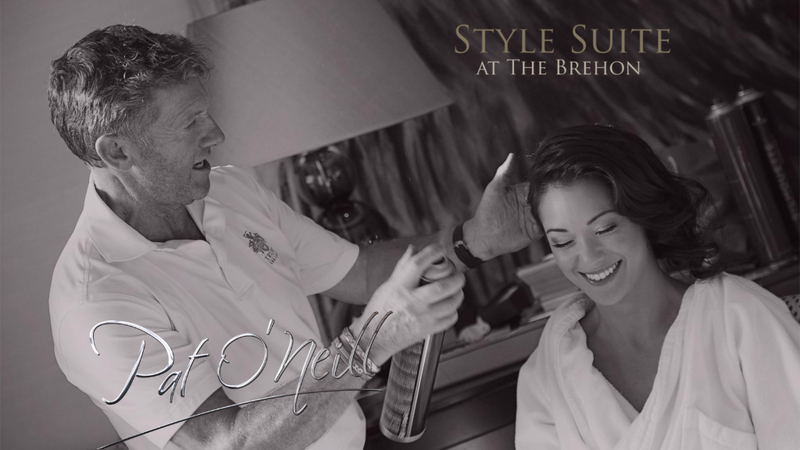 Nestled in the award winning Brehon Hotel, the Style Suite is an exclusive oasis where you can come for an array of hair cuts, colours and styles. At the forefront of Fashion and Wedding Hair styling, Pat regularly runs exquisite events at the Style Style. Join Pat for future events. Pat came to my venue in the morning, we played music we danced and we laugh so so much!!! If you are looking for a stress free morning prep for your wedding, stop looking, Pat O’ Neil is the man you all need brides!!! Pat, You were absolutely amazing on the day of the wedding and the lead up to it and I’m so glad I choose you to do my hair. I’ve never been as happy with my hair in my life, both on the day of the wedding and the day after. You really are so talented, all the girls and the two mammies were also over the moon with their hair. I loved my hair and got so many compliments. I’ve known Pat since his days upstairs in College Street and have followed him from there to Haircut 100, onto Fair Hill and more recently he can be found in The Style Suite in the Brehon. There was debates over churches, indecision on hotels but there was one thing for sure, Pat was always going to be the only man for the hair! He is a perfectionist and an expert, you’re in safe hands and in creative hands! Thanks Pat for playing a major part in our magical day. Pat, You were absolutely amazing on the day of the wedding and the lead up to it and I’m so glad I choose you to do my hair. I’ve never been as happy with my hair in my life, both on the day of the wedding and the day after. You really are so talented, all the girls and the two mammies were also over the moon with their hair. I loved my hair and got so many compliments. Not only was your work second to none but the craic we had with the you and the atmosphere you helped to create on the morning of the wedding was brill, you couldn’t put a price on that. When my husband and I chose the beautiful Aghadoe Heights as the backdrop for our wedding in January, Pat came highly recommended. I asked him if he could do my hair for my wedding day and he was so obliging and utterly reliable. Pat was so giving of his time in the lead up to our wedding and took a great interest in the looks I was going for. Thank you for everything Pat – you really enhanced what was such an amazing day for us. Pat, you are so easy and flexible to work with and you were always available to fit into my schedule before our wedding. You are beyond talented and I am so glad you were able to do my hair. You are a professional through and through. You really made me look beautiful and I can’t thank you enough. Pat is an incredibly talented artist and a really lovely person. Pat offers a first class service and is someone who really cares and listens to what the bride and bridal party want. He made such a positive impression on my whole family and I am so thankful to him for everything he did for us. To the MacGyver of Hairdressers……you were amazing!!! Not only did you do our hair so well that we all loved ourselves, you also did the alterations for the wedding dress in 2 seconds flat, fixed hats for some of the guest, had us all in stitches, calmed the bride down and did I say had us all in stitches?? You helped make the day special and I always look back on the morning and smile because all we did was laugh! You really did everything and more that anyone could have asked for… THANK YOU, THANK YOU, THANK YOU!! I could go on about how amazing you were but really and truly THANK YOU! !